This perennial evergreen is an attractive and useful creeping groundcover. Showy white flowers brighten up a shady corner in the spring, followed by berries that are small but quite tasty. Plant in shade or part shade. 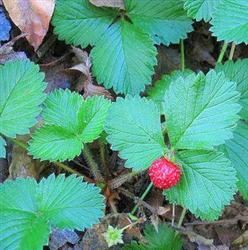 This is an ideal plant to place under oak trees or to fill in between other larger plants.